Introducing my Fibryomyalgia Guardian Angel charm. The upside down ribbon represents the angel with the top sections being the wings. The heart in the center symbolizes all the hardships that come along with fibromyalgia and is also a visual symbol of praying hands. Pink is for women (90% of those afflicted with fibro are women). Crimson is for chronic pain. Together they equal women in chronic pain. The face of the angel is Swarovski crystal and topped with a halo. 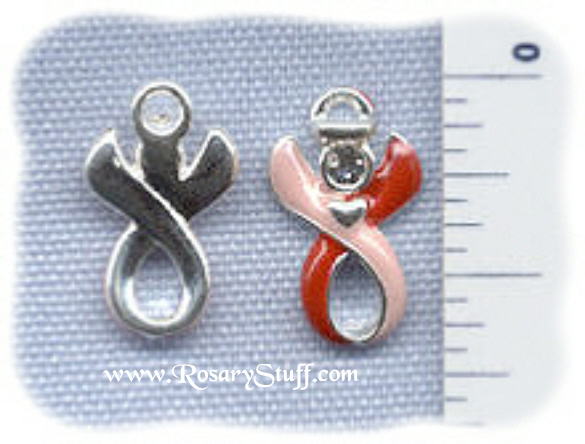 The rest of the charm is made from silver plate and enamel. They are 5/8 inch tall by 3/8 inch wide and the price is for 1 charm. Discounts are available for bulk buyers. This is my own personal design and as such is protected by copyright.